This year CSANR sponsored registration for several WSU students to attend the Tilth Conference. We will be posting reflections written by the students over the next several weeks. Please feel free to comment and give these students your feedback. My research work at Washington State University deals with environmental problems associated with big agricultural enterprises, with a focus on large dairy operations. However, I got an opportunity to hear the concerns of small acreage farmers during the Tilth Conference. A glance at the State of Washington statistics tells us that about 89% of the farms are classified as small farms. Like other small businesses, these farms are valuable community assets, generating both income and employment as well as serving critical environmental, aesthetic, and social functions. These small, family owned and operated farms produce a range of commodities from fresh vegetables and fruits to meats, dairy products, flowers, and grain crops. These small entrepreneurs, particularly those with organic practices, have a variety of challenges and fewer choices. A big challenge for these small organic farms is getting financial support. Many banks are reluctant to approve loans to them, as financial institutions do not consider very small operations to be viable agriculture. In contrast to the perceptions of lenders, however, consumer support is growing for small scale, local agriculture. Farmers are seeing a rise in community support for small farms and a preference for local and organic produce options, thus farmers are challenged to meet the demand with little financial support. Therefore, the potential for locally available nutrient sources could decrease the input cost. Large cattle operations referred to as CAFOs (Confined Animal Feeding Operations) could be a source of low-cost essential nutrients for nearby small farms. These CAFOs, particularly dairy operations, have grown significantly in past three decades in central and western part of Washington. An analysis of whole-farm nutrient fate shows that more nutrients are imported to these CAFOs than are exported, providing a considerable surplus of nutrients, particularly nitrogen and phosphorus. A decrease in animal-to-land ratio driven by an increase in herd size is a major cause of nutrient buildup on these dairy farms. These excess nutrients in soil may contaminate water resources, killing aquatic life, and causing waterborne diseases in humans if not managed properly. To comply with the Clean Water Act, these CAFOs are required to implement comprehensive nutrient management plans to make sure they are not exceeding the nutrient concentration beyond the soil carrying capacity. Manure field spreading. Photo: NRCS. Exporting manure from large dairy operations to small farms has the potential to benefit both: the large CAFOs get rid of excess nutrients that may build up in soils beyond the crop need, while the small farms receive essential nutrients to fertilize their crops. The use of manure is cost effective, primarily given the haulage cost to the farm, and it has micronutrients needed by crops that synthetic fertilizer does not carry. In addition, the use of manure improves the soil tilth, reduces the risk of soil erosion, adds organic matter to soils, improves the water holding capacity, and turns manure to an asset. 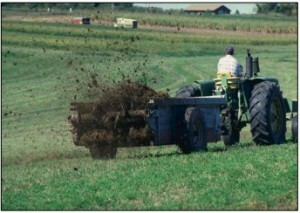 Though the use of manure offers many benefits, its use under certain conditions can be a risk. Fresh manure contains pathogens that may pose serious health problems, particularly when applied to crops eaten raw and that are grown near or in soil like carrots, strawberries, and greens. To avoid the risk of pathogens, fresh manure should be applied at least four months prior the harvest. Manure treatment processes like anaerobic digestion and composting kill most of the pathogens and add value to the manure. Maintaining the nutrient management plan through soil testing every 3-5 years and manure analysis annually will maximize the nutrient benefits of manure – benefitting soil, crop, and environment. 11 thoughts on "CAFOs manure use on small farms – from liability to asset"
Hey CAFO, is that lipstick on your confined pig? As a Permaculturist and small farmer, this doesn’t sound like a solution at all. It sounds like an attempt by big agriculture to dump it’s waste off on unsuspecting small farms like me. I don’t want your hormone-filled tortured cow excrement…that is your responsibility to deal with not mine. A perfect, comprehensive, easy to understand and applicable research. Getting rid of fresh manure from farm is very laborious for small farmers and also poses a very serious risk to livestock and their attendants if not properly managed. The best option is to apply these highly nutritious substance in field or to convert it into bio-fuel. A Great effort and research contribution by Engr. 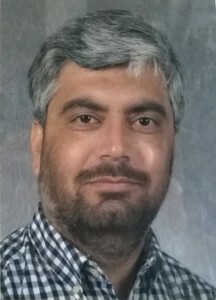 Tariq Khalil. A good idea with potential opportunities in future to recycle nutrients and increase carbon foot prints. How would organic certification policy affect the ability of a small organic farm to use CAFO generated manure when that livestock had received antibiotics, hormones, non organic feed? Great blog, Tariq. We need more minds focused on balancing local nutrient cycles to renew our soils and generate healthy agro-ecosystems. Yes, Lori, certified organic farms can usually use manure or compost from non-organic farms even if they are using antibiotics, hormones, or non-organic feed. There are timing restrictions that prevent raw manure from contacting crops within 90 or 120 days before harvest. (WSDA guidelines here: http://agr.wa.gov/FoodAnimal/Organic/docs/3013_Manure_Compost_Applications_Factsheet.pdf) . Certifiers have also started randomly testing organic products for many synthetic and non-allowed materials, so anything used on the farm that may contaminate the products could jeopardize certification. Certified farms need to work closely with their certifier to make sure inputs are allowed AND free of or low in contaminants. Thanks for this knowledge. If we could concentrate nitrogen and phosphorus, it would be easy to transport to some crop fields that really need them.